Portsmouth High School students Zach Kinney, Micah Simmons, Sarah Simmons, and Sara Born sign a rousing rendition of the Star-Spangled Banner. A breathtaking view that sits at the confluence of the Scioto and Ohio Rivers, it’s one of the most beautiful views one could ever hope to find anywhere in the State of Ohio, in the Tri-State Area, or even in all of Appalachia. In fact, it’s a place where — especially during the summer months — people will go to enjoy ice cream from the Second Street Dairy Bar (also called Dari-Creme), walk their dogs, or even just enjoy the amazing view of the aforementioned rivers, the Carl Perkins Bridge, and hills that are part of Greenup County, Ky. (off to the left) and Scioto County (off to the right). The continued enjoyment of that view, however, wouldn’t be possible without the work of Sue Burke, who is the Chairman of Main Street Portsmouth. And as a result of the endless hours of work that Burke has put in — as part of trying to accomplish one of her primary missions in life, which is to continue to show that Portsmouth is, indeed, a city to be respected and not taken lightly — the Scioto County Chamber of Commerce only felt that it was fair that Burke experience a once-in-a-lifetime opportunity. Burke, who also serves as the President of the Main Street Portsmouth Board of Directors, was given the opportunity to throw out one of two first pitches — the other going to Asher Kearney as part of Jackie Robinson Day — as Portsmouth Day also occurred at Great American Ballpark in Cincinnati. In Steve Hayes’ eyes, however, there aren’t many people who can say that they deserve the opportunity as much as Burke can. Burke, who unselfishly deflected the attention to Hayes, Tim Armes, and the late Paul Johnson, among others, for their work within Main Street Portsmouth, has done yeoman’s work in several different areas with the organization. Within the last five years, Burke has helped lead projects that have included hanging baskets, flowerpots, and window planters, and maintaining said areas throughout the year by decorating the flowerpots with mums and fresh cut evergreens during the fall and winter, and by decorating the urns in front of the murals, Market Square, and the Roy Rogers Esplanade. This past fall, the first phase of a project, which is designed to replace six benches in Tracy Park and four additional benches on Front Street with a more classic design, also commenced due to Burke’s work with MSP. In addition to spearheading projects that have helped with the beautification of inland areas around the City of Portsmouth, Burke has assisted in the development of Final Friday in Boneyfiddle, and has, with Main Street Portsmouth, raised over six figures into maintaining, and enhancing, the quality of Alexandria Point. In each of the aforementioned projects, Burke has been right on the frontlines putting together the aesthetic looks that many have enjoyed, and are enjoying, today. 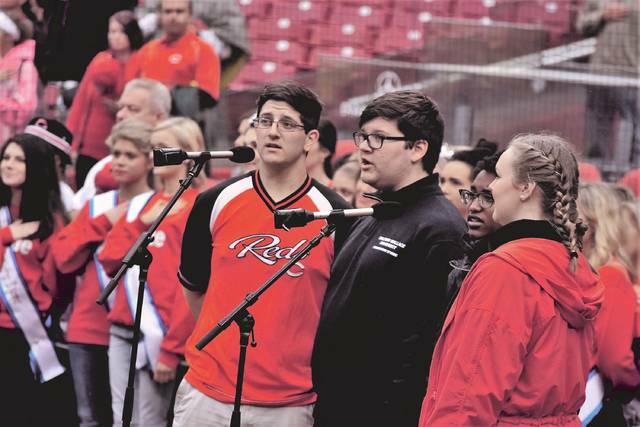 In addition to Burke throwing out the first pitch, Portsmouth High School students Zach Kinney, Sara Born, Sarah Simmons, and Micah Simmons all sang a rousing rendition of the Star-Spangled Banner as a quartet. Kinney is a talented pitcher and outfielder for the Trojans on the baseball diamond, while Born and the Simmons’ have starred on the Mock Trial unit for Portsmouth, with Sarah Simmons winning an Outstanding Witness award last year and Born, along with Micah Simmons, winning Outstanding Attorney awards last year as well. Sarah and Micah Simmons have performed in plays such as ‘Aida’ and ‘The Wizard of Oz’ as part of the Portsmouth Music Department. The Cincinnati Reds, despite a strong seven-inning effort from Homer Bailey on the mound, fell to the St. Louis Cardinals by a 3-2 tally as Cincinnati fell to 2-13 on the year with the defeat. Bailey, who allowed just four hits from the hill, struck out four and walked two for a two-to-one strikeout-to-walk ratio. A home run by the Cardinals’ Harrison Bader in the top of the second inning — which also scored Yadier Molina, and an RBI single by Molina that scored Jose Martinez, proved to be the lone salvos in the contest for St. Louis. The hard-throwing Texan threw 54 of his 90 pitches for strikes in the contest. Amir Garrett (1 2/3 IP, H, 2 K) and Tyler Hughes (1/3 IP) finished off the affair in relief. Cincinnati, who managed just two hits on Sunday, went 0-for-8 (two walks, hit by pitch) with runners in scoring position and hit into two double plays, which allowed St. Louis’ Carlos Martinez to match Bailey pitch-for-pitch. Overall, Martinez struck out 11 Reds on 108 pitches by throwing 71 pitches for strikes during the affair. Martinez walked four, but used the two double plays to lead St. Louis’ (9-7) efforts and obtain the winning decision. In the eighth and ninth innings, Cincinnati attempted to make a rally as Billy Hamilton and Adam Duvall hit leadoff home runs in back-to-back frames off of Tyler Lyons and Bud Norris, respectively, to close the gap to 3-2. After Duvall’s home run, Tucker Barnhart legged out a bunt single and advanced to second via runner interference, and Devin Mesoraco, who came on in a pinch-hitting situation, was hit by a pitch. However, Alex Blandino, Phil Ervin, and Hamilton were retired in order as Norris obtained the save and preserved the decision for Martinez and St. Louis. In addition to Burke’s pitch as part of Portsmouth Day, Asher Kearney threw out a ceremonial first pitch, as well, as part of the league-wide celebration of Jackie Robinson Day. Kearney’s father, Eric — the President and CEO of the Cincinnati/Northern Kentucky African-American Chamber of Commerce — caught the younger Kearney from behind the plate. As per Jackie Robinson Day tradition, all players wore the No. 42 in honor of Robinson — the first African-American since 1880 to break the major league color barrier. The man who signed him — Branch Rickey — was born in Portsmouth.